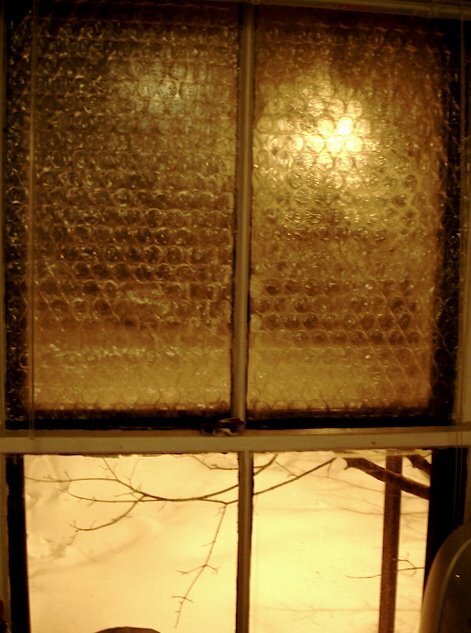 It was the coldest night of the year here so far: -14F/-26C out there this morning. Up north in the state it’s -36F/-38C. Admittedly we had the heat on a bit overnight, but it’s off again now. 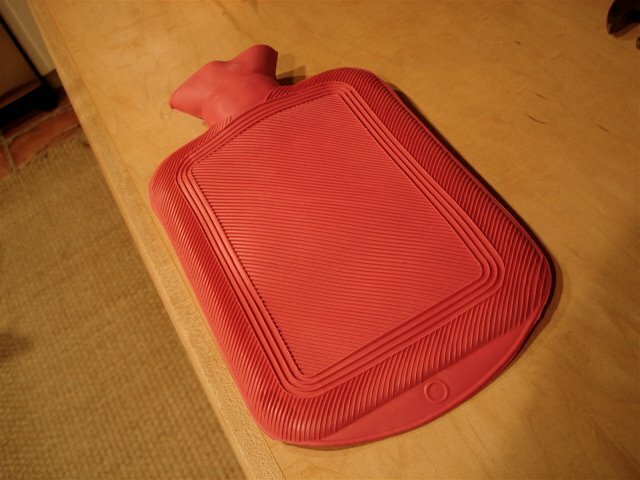 This classic hot-water bottle sells for $3.09 at Dan & Whit’s Country Store in Norwich, VT. I bought one for myself, and one for my housemate. They are made in China and, sadly, reeked of diesel fuel or some similar petroleum product until they had been well-scrubbed. I would not advise using one as a canteen or cat-waterer. However, when filled with steaming water and wrapped in a towel, it provides a fantastic and surprisingly long-lasting heat to the bedtime footsies. In fact, the first night, the water was too hot and I had to keep moving my feet away. “>buy some cheap. And! You can use it again next year! This entry was posted on January 16, 2009 at 3:54 am and is filed under Uncategorized. You can follow any responses to this entry through the RSS 2.0 feed. You can leave a response, or trackback from your own site. I was wondering when you were going to get to the old trusty hot water bottle! They are a life safer to cold beds, cold feet…cold. My two were bought at Rite Aide so were over $5, but they are worth it. When I go to bed I fill mine with our hottest tap water and it is usually just right for an uncovered, direct heat delivery to either bed cloths, feet, hands, legs, belly… ah… And it spares my husband the shock of my cold extremities. I used to take a soap stone to bed with me(it still lives on the corner of our wood burning cookstove that is our primary source of heat and cooking which runs as long as anyone is awake- me til after midnight- hubby before 5am; and is used to warm my feet- thru shoes- when I sit at my computer with down coat/and or wrapped in plush blankets). I’d put the flat bare stone between the sheets to warm them while I washed teeth etc. and then wrap it in a towel and put it down at my feet. But one night I got distracted and whipped the the bed cloths back and sat down unconsciously… right on the HOT soap stone. It was immediate 2nd degree burns that I iced all night… the cold irony to the situation. The soap stone has never been back to my bed since. But a hot water bottle is an even better solution. It is soft and squishy and more user friendly to more parts of the body. Cold house/warm bed. Best winter solution! My grandmother had a “bed stone” too. I remember some story about grandma giving herself a hernia while trying to shift it around in bed with her foot. They seem dangerous. Ooooh, can’t WAIT to try the bubblewrap! Have tons in a bag in the basement. Two things warm me up. The first solution I've been doing for awhile, and that is to take a hot bath right before bed. Morning too, but it does get expensive, uses a lot of water.The other big help I noticed when it was starting to get chilly in the late afternoon when the sun went down and I was cold in the house, through my slacks and everything, it was making me irritible as I fixed dinner. I put my heavy fleece bathrobe on right over all my clothes. I was very comfortable in minutes.